In 1987 two musicologists compiled a catalogue of the oratorios written in Naples between 1650 and 1707. They found dozens of librettos, but hardly any music. This attests to the popularity of the genre but also to the huge loss of music from the 17th century. That makes the discovery of a manuscript with four oratorios by Gaetano Veneziano especially important, even more so as he is an interesting figure from the early stages of a development which made Naples one of Europe's main centres of music. At the age of ten he entered the conservatory S Maria di Loreto; his teacher was Francesco Provenzale. He developed into a key figure in the Neapolitan music scene as he held positions at the court (the Real Cappella), the church of Carmine Maggiore and at his old conservatory. In 1703 Alessandro Scarlatti left Naples, and the next year Veneziano was appointed as his successor in the position of maestro di cappella of the Real Cappella. However, only three years later he lost his job when Naples was captured from the Spanish by Austria. Veneziano left a considerable number of compositions; more than 120 have been authenticated and these include mainly sacred works, such as Passions and oratorios and a number of liturgical pieces. The work-list in New Grove omits the four oratorios I have just referred to. La Santissima Trinità is one of them. It was written in 1693; the librettist is Andrea Perrucci who was one of the major opera librettists in Naples. He often worked with Provenzale. The central figure in the oratorio is the Virgin Mary (Vergine). After a sinfonia a chorus tells us: "Attributes of the Divine, assemble in council, now that the everlasting creator of all things is in his nobility minded to create the Mother of his great Son". We meet three characters: Omnipotence (Onnipotenza), Divine Love (Amor Divino) and Wisdom (Sapienza). These are allegorical figures, representing God the Father, the Son and the Holy Spirit respectively. In their recitatives and arias they tell in what way and why they are involved in the creation of Mary as mother of the Son of God. They then join in a trio: "Let her be born whose splendour will outshine light itself. (...) The world will receive the benefit, for thus will be revealed the attributes of God". Mary herself and the three allegorical characters dwell upon the virtues of the Virgin and her significance for the faithful. The latter sing another trio: "New adornment to the throne of God, Mary, you now complement the Triad. (...) [From] the treasury, the habitation, the garden of God may be sin far away". Then Sin (Peccato) enters: "May Sin be far away? (...) I will make her drink my venom; Mary is my subject if she be a daughter of Eve!". His recitative is followed by an aria in which he urges his followers to take up arms. He then gets involved in a dialogue with the three allegorical characters, and in the end has to admit defeat as Mary, through the power of Omnipotence, had been delivered from original sin before conception. The oratorio ends with a chorus in praise of the Virgin Mary. This oratorio bears witness to the fact that at that time there was little difference between sacred and secular music. The very concept of this work, with the connection between Mary and the three allegorical characters, has clear reminiscences of opera and secular cantatas. At the same time the text includes biblical images, especially the books of Genesis (garden of God, the venom of Sin and Eve treading underfoot the snake), the Song of Songs and Revelation (the "river of poison that will drown Mary"). The title of the oratorio is also connected to the fraternity for which it was written: the Real Arciconfraternità ovvero Congregazione de' Nobili sotto il titolo di S. Maria del Remedio della SS. Trinità which focused on charity with collections of money on behalf of prisoners, prior to their being liberated. Interestingly we know the names of the singers who participated in the first performance. As was common practice at the time all the parts were sung by men, the three upper voices taken by castratos. Most of them can be identified, and they belonged to the best singers in Naples at the time who sang at various institutions, including the royal chapel. The scoring for five voices, singing the solo parts and the tutti, is in line with the convention of the time - the other oratorios in the collection have the same scoring. That also goes for the instrumental line-up: two violins, viola and basso continuo. It is likely that oratorios were performed with one instrument per part as is the case in this recording. Most arias are rather short, less than three minutes. Vergine's aria Il tuo stral divino arciero is by far the longest, taking here just over six minutes. They are all written in dacapo form, except two arias by Vergine which have an AB structure, but there the B part strongly contrasts with the A part and is not repeated. The role of the strings is various: they fully participate in some arias, accompanying the voice, in others they only play ritornellos, with the singer supported by the basso continuo alone. There are also a couple of arias with an obbligato part for one violin. Although there are similarities between this oratorio and the secular music of the time the performers have avoided making it too operatic. The singers add quite some ornamentation, but they show a sound restraint in this department and avoid an excess of virtuosity. The two sopranos have nice voices but are different enough to tell them apart. Giuseppe Naviglio gives a good account of the part of Peccato. Recently I have heard Filippo Mineccia, and my positive impressions of his singing are confirmed here. I also have expressed my reservations in regard to Rosario Totaro; in another recording he reminded me of a bleating goat. It is not as bad here as in that production but I still don't find his voice and his style of singing very attractive. Fortunately his role is rather limited. This disc is a welcome addition to the discography of Neapolitan music and of Italian oratorio in general. Veneziano once again turns out to be a fine composer. 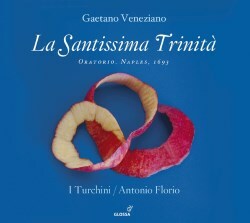 It would be nice if Antonio Florio will have the opportunity to record other oratorios from the collection which also includes La Santissima Trinità.